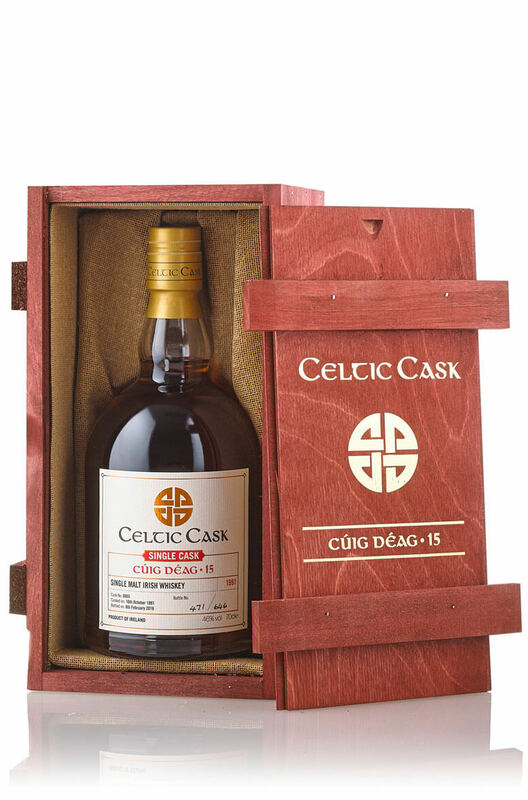 Celtic Cask Cuig Deag is our fifteenth special release and is another great example of a perfectly matured Irish whiskey. We sourced some unique whiskey that had been matured in a bourbon cask for 22 years. It came from a very well known distillery on the island of Ireland, but we cannot divulge any more than that! The whiskey was then transferred into a specially sourced port pipe from one of Portugal's finest wine makers, Quinta do Noval. A further maturation period of over two years gave this richly flavoured whiskey an extra dimension. This is one of our all time favourite Irish whiskeys and is something we are incredibly proud of. Nose Fresh and lively with aromas of orange peel, marmalade, red grapes, fruit cake and boiled sweets. Palate Complex notes of oranges, pineapple, cherries then vanilla, ginger, cinnamon, linseed oil and oak. Finish Lightly smoky and pleasantly spicy. Additional Information Non chill filtered. Types of Barley Made using a unique crystal malt. Types of Barrel used for Aging Initially aged for 22 years in a standard bourbon barrel before being finished in a Quinta do Noval port pipe for over two years. Celtic Cask Seacht Déag is a double distilled single malt that was initially matured in a Bou..
Celtic Cask Ocht Déag is a double distilled single malt that was initially matured in a Bourb..